ALISO VIEJO, CA – March 4, 2014 – Smith Micro Software, Inc. (NASDAQ: SMSI) Productivity and Graphics Group today announced the availability of Anime Studio® Pro 10 and Anime Studio Debut® 10, the most intuitive animation software available that allows artists of all ages and skill levels to craft high-quality 2D animations for personal or professional expression. With enhanced features that provide increased bone control, more movement options and new tools, Anime Studio 10 gives artists improved ways to easily and quickly create stunning animated content. To celebrate the 10th edition of Anime Studio, Smith Micro has teamed up with Wacom Technology, makers of digital interface solutions, for a giveaway with no purchase necessary. From March 4th, 2014 to April 4th, 2014 users can enter for the chance to win a Wacom Cintiq Companion grand prize or a Intuos Pro Medium or Intuos Medium tablet for second and third place prizes. As well, award-winning animator Victor Paredes has created an exclusive animation clip with Anime Studio 10, highlighting the various ways users can utilize preloaded content available immediately in the software. Anime Studio Pro 10 is the perfect addition to any experienced artist’s repertoire. The latest bone features include rigging options to help set up more complex characters. The independent angle constraints allows bones to keep their global angle and are not affected by inverse kinematics, while the squash and stretch feature allows bones to retain their shape and direction as they move. The new Smart Bone Dials allow users to set up movement templates for characters – simply select the bones, adjust to the desired angle, input the duration and name the movement. Anime Studio Debut 10 introduces users to the world of 2D animation with useful tools and elements that allow any graphic artist to produce work of the same caliber as experienced animators. New design tools such as the Paint Bucket, Blob Brush, Eraser and Reduce Points make it painless to manipulate objects into desired shapes. 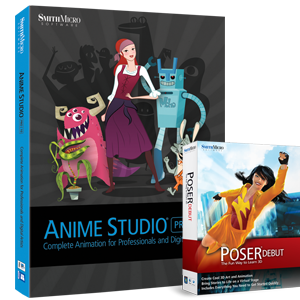 Anime Studio Pro 10 is available for $299.99 and Anime Studio Debut 10 is $49.99. More detailed product, pricing and upgrade information is available here. Wacom’s vision to bring people and technology closer together through natural interface technologies has made it the world’s leading manufacturer of pen tablets, interactive pen displays and digital interface solutions. The advanced technology of Wacom’s intuitive input devices has been used to create some of the most exciting digital art, films, special effects, fashion and designs around the world. Today, millions of hobbyist, enthusiast and professional customers are using Wacom’s pen and touch technology to express their creativity. This release contains forward-looking statements that involve risks and uncertainties, including without limitation, forward-looking statements relating to the company’s financial prospects and other projections of its performance, the existence of new market opportunities and interest in the company’s products and solutions, and the company’s ability to increase its revenue and regain profitability by capitalizing on these new market opportunities and interest and introducing new products and solutions. Among the important factors that could cause actual results to differ materially from those expressed or implied in the forward-looking statements are changes in demand for the company’s products from its customers and their end-users, customer concentration given that the majority of our sales depend on a few large client relationships, including Sprint, new and changing technologies, customer acceptance and timing of deployment of those technologies, new and continuing adverse economic conditions, and the company’s ability to compete effectively with other software companies. These and other factors discussed in the company’s filings with the Securities and Exchange Commission, including its filings on Forms 10-K and 10-Q, could cause actual results to differ materially from those expressed or implied in any forward-looking statements. The forward-looking statements contained in this release are made on the basis of the views and assumptions of management regarding future events and business performance as of the date of this release, and the company does not undertake any obligation to update these statements to reflect events or circumstances occurring after the date of this release.